Article Photo One of CHAT's star players, Kevin Treger, driving against a Frisch defender in the championship game April 3. Apr 4, 2006 — For the first time in the 15-year history of Yeshiva University’s Red Sarachek Basketball Tournament, the champions emerged from outside the United States. Community Hebrew Academy of Toronto (CHAT) defeated Frisch School of Paramus, NJ, 52-42 April 3 to claim the coveted high school championship. The tournament took place at YU’s Max Stern Athletic Center in Washington Heights. On its way to the ultimate victory, CHAT bested last year’s champion, Young Israel of Century City, one of two tournament teams from Los Angeles. The two players credited with CHAT’s successful run in the tournament were guard/forward Kevin Treger and the team’s 6-foot-7 center Jared Mintz, who finished the championship with a game-high 21 points. For the second year in a row, Frisch made it to the championship having lost last year to Young Israel of Century City. Before Monday night, no team outside the U.S. had ever reached the final championship game of the Sarachek Tournament, which began in 1992. Other Canadian teams that have participated in the tournament during the past several years include Hebrew Academy of Montreal and Yeshivat Ohr Chaim of Toronto, both of which also qualified this year. 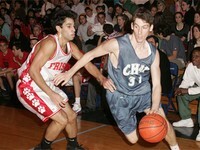 The 2006 tournament featured 18 Jewish high school basketball teams representing such diverse U.S. locales as Los Angeles, Chicago, Atlanta, Dallas, Memphis, and Boca Raton. YU’s High School for Boys (Marsha Stern Talmudical Academy), Ramaz of Manhattan, Frisch, and North Shore Hebrew Academy of Long Island rounded out the metro area contingent. The annual Sarachek Basketball Tournament is named for YU’s legendary men’s college basketball coach, Bernard “Red” Sarachek. This year’s 2006 invitational is the first to take place since its namesake’s death. Red Sarachek died November 25, 2005 at the age of 93. Upon his passing, Sarachek was remembered in obituaries around the country as a basketball innovator and trail blazer.